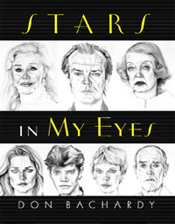 Stars in My Eyes is a revealing and entertaining collection of celebrity portraits, rendered both in acute drawings and in finely observed prose. In the 1970s and 1980s, internationally known artist Don Bachardy made portraits from life, depicting the actors, writers, artists, composers, directors, and Hollywood elite that he and his partner Christopher Isherwood knew. He then made detailed notes about these portrait sittings in the journal he has kept for more than forty years. The result is a unique document: we enter the mind of the artist as he records the images and behavior of his celebrity subjects—from Ruby Keeler and Barbara Stanwyck to Jack Nicholson and Linda Ronstadt—during their often intense collaboration with him. 8 x 10 272 pp. Isherwood’s novel of the same name.